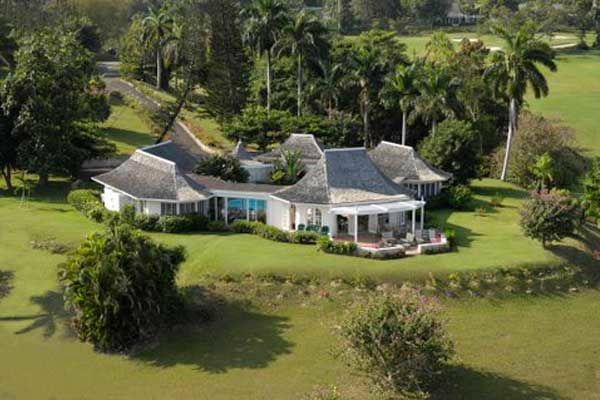 Built and owned by the same family for over forty years, Ma’Moura’s unique setting comprised of four lots, sits high on a hill overlooking the 17th green and the Caribbean Sea. Enjoying cool breezes and unobstructed views, this villa provides one of the most private yet outdoor experiences at Tryall. Cared for by an award- winning staff of five who dedicate themselves to fulfilling your every need, Ma’Moura boasts repeat guests year after year. Upon arrival, guests are welcomed with warm smiles, a cool towel and an “Engine Runner”, the house drink. Ma’Moura is for guests who want an authentic, “unfussy” villa in an unforgettable setting with an uncompromising staff. Ma’Moura has four bedrooms with a wonderful circular and octagonal design that embraces spectacular views of the Caribbean Sea from all angles. A fluid, transparent light glows in the living room and captures seductive vistas of gardens, golf course and sea below. With its comfortable Caribbean style, the living room is a perfect haven for family and friends to gather. There is a backgammon table, bridge table, flat screen TV, and DVD player. With arched doors all around, the living room opens to the pool and to a newly added terrace outdoors, a perfect setting for evening cocktails or dinner under the pergola. Surrounding the circular swimming pool are Ma’Moura’s bedrooms, dining area, sitting area, kitchen, dining gazebo and bar. Each bedroom is air-conditioned with safe and flat screen TV as well as ensuite bathroom. The master bedroom has a four-poster king-sized bed. Another guest room has a king size bed and another has 2 four-poster queen size beds. The fourth bedroom has 2 twin size beds that can be converted to a king. All of the bathrooms have been completely refurbished and each bathroom has an outdoor shower. The villa staff comprises a butler, cook, housekeeper, laundress and gardener.